Dhokla is the most popular snack in the Gujarati Cuisine. Every one loves it as it is very light and healthy. You can even add some grated veggies for variation. Today's recipe is the instant one with semolina and yogurt. It is perfect and sure shot recipe for a day when you have unexpected guests as the ingredients are all basic and available in out kitchens always. Chilli paste ........ 1/2 tsp. Haldi powder ............. 1/4 tsp. Mustard seeds .... 1 tbsp. 1. Mix the sooji, curd, salt, sugar, haldi, oil, chilli paste and ginger garlic paste into a smooth and thick batter,adding a little water. 2. Put eno and on top of it squeeze the lime juice and then mix the batter well. 3. Put the batter in a greased plate and steam it for 15 minutes. 4. Let it cool a little, then cut into pieces. 6. Garnish with grated coconut and coriander leaves. 7. Serve with mint chutney. keep it up and appreciate you good work and interest. love.. Instant gratification - love this! This looks so tasty! Flavor packed dhoklas. Thanks for sharing! Shobha the dhoklas looks yummy.One day i treid but it does not came out good.From then i did not try for next time.Will try for another time. Making healthy evening snacks are always challenging and this is such a good idea. Awesome recipe. they are just delicious..tasty !! dhoklas looks mouthwatering...loved the cute basket in which the chutney is being served..
Can finish those irresistible dhoklas rite now,yummy..
Looks tasty I love this instant recipe I always make these when un announced viistors drop by.Love the little serving pot garnish you have used for chutney. This is a real quick and satisfying snack. Wonderful recipe Shobha. Thanks a bunch for linking this to my event. 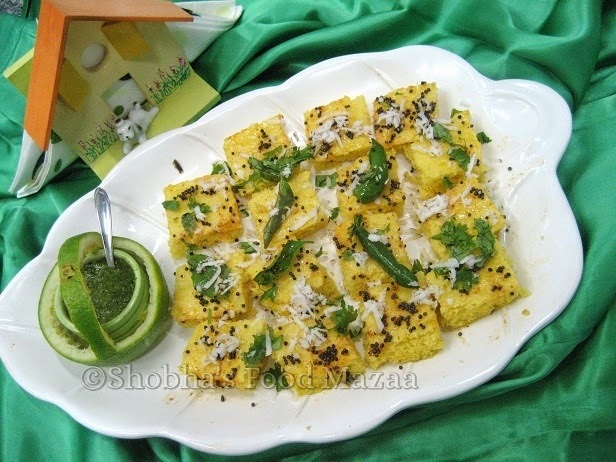 Dhoklas look yummy and thx for linking to the event. Hi. Love these anytime and so light to eat. I love the first comment. Its from Seema. Love the instant dhokla. How much lemon juice? I want to make this hubby is dhokla fan. Ha ha .. that's my favourite comment till date ! You always make such different and amazing food. I make these all the time we love them and they are so quick to make.